Eugenio John Sanelli, son of Eugenio Sanelli and Rosalia Schiavo, was born in Philadelphia, Pennsylvania., on May 31, 1927, and was baptized on December 3, 1927, in the church of Saint Nicholas of Tolentine, Philadelphia. He applied to the Philadelphia Vice-Province as a lay-brother, choosing the name Jude, and fulfilled the oblature and postulancy at Saint Augustine Monastery, Nova Scotia. 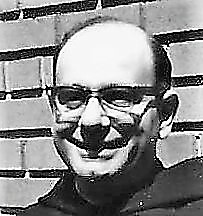 He then entered Our Mother of Good Counsel Novitiate, New Hamburgh, New York, on September 6, 1952, and made first profession of vows on September 7, 1953. Three years later he professed solemn vows in Saint Nicholas of Tolentine Church, Philadelphia. Brother Jude’s desire to help the poor and elderly followed upon his ministry of operating a day nursery and pre-kindergarten school at Saint Nicholas Church, supervising the care of about 200 children nine hours a day, five days a week. At various times he served the Vice-Province also as cook and in secretarial work. Brother Jude was a private and prayerful man who gained strength from his devotion to the Blessed Sacrament. He declined to take credit for the success of the center, claiming, “I had quite a partner. The best. When God does something, he does it well.” Brother Jude’s warmth and benevolence made him a symbol of hospitality and many of the old Italian-speaking parishioners sought him out as a spiritual director. Brother Jude became affiliated to the Province of Saint Thomas of Villanova in 1995 at the time of the suppression of the Vice-Province. He died on February 18, 2001. A Mass of the Resurrection was celebrated at Saint Nicholas of Tolentine Church in Philadelphia, Pa. with interment in Saints Peter and Paul Cemetery, Springfield, Pa. Newer Post Daniele A. Scalabrella, O.S.A. Older Post Augustus C. Sandmann, O.S.A.